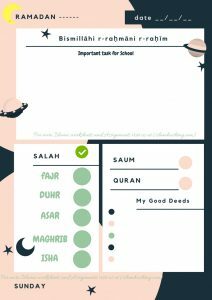 Islamic Parenting-How to raise a Pious Child? All Praise and thanks belong to Allah alone,the One the Almighty and all Merciful and blessings be on Prophet Muhammad,the last of his Messenger and Prophet.As Parents We often worry about the practical aspects of raising our children: providing them with their basic physical,emotional and coginitive need.Here are few Tips of Islamic Parenting that can help build a rock solid faith in our children’s hearts and Mind. As a Parent How much plan and effort do we put in shaping the eternal future of our child?Indeed our top priority as a parent should be to nurture them and strengthen them spiritually.Our Prophet(pbuh) was very careful and loving towards the children. Allah (S.W.T.) has entrusted parents with their children. Parents bear the responsibility to raise-up their children in the Islamic way. If they do that they will be blessed in this life and in the hereafter, and if they don’t, they will get bad result during their life and in the hereafter. Imam Bukhari and Muslim reported that the Prophet Mohammad (P.B.U.H.) said, “all of you are heads of a group and all of you are responsible for your groups; the ruler is the head of state and he is responsible for his people, the man is head of his family and responsible for his family, the woman is the head in her husband’s house and she is responsible for the house. In short all of you are heads and responsible for your groups”. Here are some conclusion that we can derive from Hadeeth of Prophet Muhammad(pbuh) directed to parents in Islam for effective Islamic Parenting. 1)Never derive your child of love and affection. Our Prophet (swas) would never refuse his affection to children, no matter what they did because affection builds a child’s self-worth. Narrated by Abu Huraira: Allah’s Messenger (peace and blessings be upon him) said, “No child is born except on Al-Fitra (Islam) and then his parents make him Jewish, Christian or Magian, as an animal produces a perfect young animal: do you see any part of its body amputated?” (Bukhari). Without Islam, we lose our balance. This is why Prophet Muhammad (swas) and the Noble Qur’aan are called Haadi, The Guide. A child is born pure without defect, but his environment amputates him from his blessing: his Islam. Abu Hurayrah (RA) once said: “The Messenger of Allaah (swas) kissed al-Hasan ibn ‘Ali, and al-Aqra’ ibn Haabis al-Tameemi was sitting with him. Al-Aqra’ said: ‘I have ten children and I have never kissed any one of them.’ The Messenger of Allaah (swas) looked at him and said: ‘The one who does not show mercy will not be shown mercy. '” “Whenever he (Muhammad, swas) came back from a journey, the children of his household would be taken out to meet him.” He (swas) used to hug them close to him, as ‘Abd-Allaah ibn Ja;far said: “Whenever the Prophet (swas) came back from a journey, we would be taken out to meet him. One day we met him, Hasan, Husayn and I. He carried one of us in front of him, and another on his back, until we entered Madeenah.” (Saheeh Muslim, 4/1885-2772; see the commentary in Tuhfat al-Ahwadhi, 8/56). 2)Play with your children – AS A CHILD! An important part of play for young children is to play with their parents, and there should be sometime for this every day.Many times, parents are too busy with work commitments, business trips, personal engagements and trying to save the world and they don’t have enough time for their children and so they let them be baby-sat with electronics. This them becomes a very affordable way to “deal” with our children, however cutting ourselves off from our children and their day to day lives will definitely cause issues in the future. A child needs to be praised to feel good about himself. Our Prophet (swas) used to carry his grandsons, Hasan and Husain (may Allaah be pleased with them) on his shoulders. When an onlooker once remarked: “What a ride he is having!”, the Prophet Muhammad (swas) promptly said: “And how majestic is the rider!” (Tirmidhi). Kids live in their emotions, and when they hear something being promised to them, they get very excited. They can picture the promise happening and keep it with the mind in a way that is much more powerful than we are able to. For this reason, they will not ever forget what you promise them! So don not even think about making a promise that you might not be able to keep.In addition, from a Quranic perspective, fulfilling one’s promise is an obligation which Allah makes reference to many times in the Qur’an that a believer is one who “fulfills his promise” and that he will be questioned on the Resurrection Day about promises which he made but did not keep – so not only will this affect a parent’s own spiritual ranking, but it will also affect the children’s perception of the parents and ultimately the religion. 5)Teach your Children the Essence of Faith! It is of vital importance that we instill Islamic teachings into our children as soon as possible – even before they come into this world when the mother is pregnant; however the “first” madressa lesson of our children should come when they arrive into this world and the proud parent recites the Adhan and Iqamah in the child’s right and left ears respectively. Sadly however, from this day forward, the teachings of the faith are left to the “community leaders”, the Madressa or others, as the parents are either too busy or do not have the prerequisite knowledge to teach even the fundamental basics to their children – and this is something which needs to stop. This powerful statement of the Prophet of Mercy is important for numerous reasons as he focuses on both aspects of life – this transient world and also the spiritual teachings. He shows us in this short saying that it is not enough for the father (and mother) to only focus on “spiritual teachings” – although these are extremely important and all parents must ensure that they impart the religion and its comprehensive nature to the next generation, but also that the Prophet was looking at fathers who did not even give their children knowledge of the world which we live in There are many life skills which are not taught in the public school system; there are even many more things which need to impart to our children but are not done in a Madressa system – so where can our children go to find such gleams of wisdom? Do we expect them to Google everything for an answer!? Most likely they will go to their friends – some of which may not have the correct moral system and may teach them things but not necessarily thing which we would like for them to engage in – and this can result in the spiritual destruction of their souls. Jazakallah Khairan Katheeran. That was a nice reference for me. Thanks a lot and May Allah bless you. Jaza-k-Allah, indeed Islam is complete code of conduct that encompass life at every angle…….